This famous old Wall Street warning is worth bearing in mind as we explore the possibility of bubbles. Because there remains no theory that explains how a bubble starts or when it will end, it is possible to be right in the assessment that current prices are irrationally high due to a bubble and still be wiped out as the bubble inflates further. 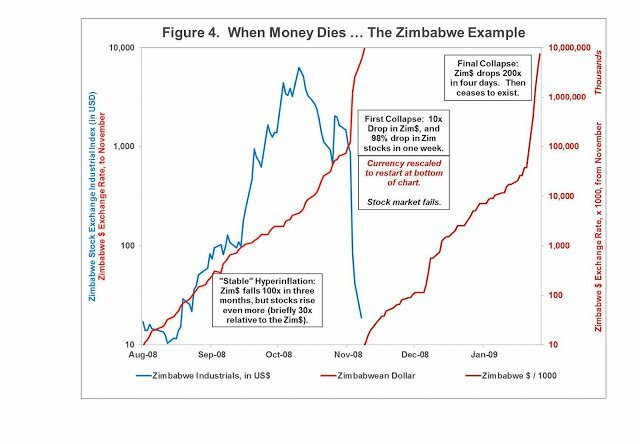 A telling example is stock market performance during Zimbabwe’s hyperinflation in 2008 and 2009. The hyperinflation is well-known. Their stock market bubble less so. The figure below shows the performance of the Zimbabwe overall stock market, in blue, while the currency was collapsing (in red, a rising exchange rate means that the currency is tumbling). The scale on this graph is quite astonishing. During the three months from the beginning of August until the end of October, the currency fell from 10 to 1000 per US dollar, a 100-fold currency collapse in just three months. Did this hurt the stock market? Hardly! The stock market rose 500-fold in just eight weeks, during which time the currency fell ten-fold. So, In US dollars, the market rose an astounding 50-fold in eight weeks. In the next two weeks, the stock market plunged 85%, even as the currency tumbled another three-fold. Again, adjusted for the tumbling currency, the stock market dropped 95% in two weeks. That’s when the currency and the stock market stepped up the volatility another order of magnitude. When the hyperinflation went into overdrive, with purchasing power falling ten-fold in less than a week, the stock market fell 99% (99.9% adjusted for the tumbling currency) in that same week. The stock market then ceased to exist. Suppose an investor had the clairvoyance to know that the market was going to tumble 1000-fold (in US dollar terms, after adjusting for the tumbling currency), in the next three months. And, suppose there was a way to short-sell that market. This would seem to be a “can’t lose” proposition. Even with prescience, knowing that the market was going to zero in three months, the investor would have first lost 50 times our money, and quite possibly bankrupted, before being proved correct! This is one of the most challenging attributes of bubbles. They are hard to transform into profits, even for investors who correctly discern them, because the late stages can take valuations into the stratosphere. Author: Brad CornellBradford Cornell is a Visiting Professor of Financial Economics at Caltech and a Senior Consultant at CompassLexecon. Prior to joining the Caltech faculty, Dr. Cornell was the Bank of America Professor of Finance at the Anderson Graduate School of Management, University of California, Los Angeles. In his academic capacity, Professor Cornell has published more than 100 articles on a wide variety of financial topics. 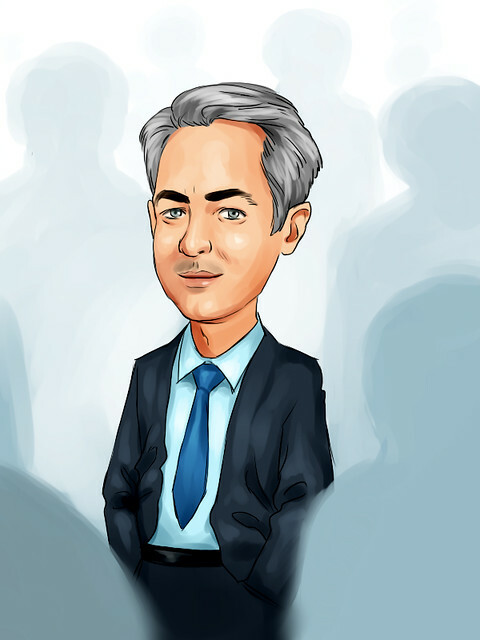 He is also the author of Corporate Valuation: Tools for Effective Appraisal and Decision Making, published by Business One Irwin, and The Equity Risk Premium and the Long-Run Future of the Stock Market, published by John Wiley. He is a past Director and Vice-President of the Western Finance Association and a past Director of the American Finance Association. As a consultant, Professor Cornell has provided testimony and expert analysis in some of the largest and most widely publicized finance related cases in the United States. Among his clients are: AT&T, Berkshire Hathaway, Bristol-Myers, Citigroup, Credit Suisse, General Motors, Goldman Sachs, Merck, Microsoft, Morgan Stanley, Orange County CA, Price Waterhouse, Verizon, Walt Disney and various agencies of the United States Government. Professor Cornell is also the founder of San Marino Business Partners, a private investment firm.